When you want a neutral finish that will match any décor and look great for decades, Adalia Cappuccino is the right stone for you. The soft brown colors mingle with shades of gray and tan to give this stone the illusion of movement while maintaining the understated yet elegant look. It’s a stone that’s content fading into the background while still setting the sophisticated tone for the room. In short, it’s a wonderful selection for nearly any area of your home. Here are just a few ideas for adding this luxurious stone to your property. People have long appreciated the value of putting tile on a bathroom wall. It’s easy to clean, and it will last years. While the colorful subway tiles and mosaics of past decades have fallen out of fashion, homeowners are sure to love the look of Adalia Cappuccino as a wall covering. The neutral finish and brown shades are commonly used for paint, so the initial impression will be that your wall has a decorative painted finish. With large tiles available, you’ll minimize the seam lines so that the tiles won’t feel overwhelming. Your guests will be impressed when they realize that the surface is actually durable and elegant marble. This type of treatment is a popular choice for shower and tub surrounds, but you can carry it through to the bathroom walls in the main room, as well. If you’re trying to decorate a room that feels a little dark, choose the highly polished Adalia Cappuccino. One of the great features of marble is that polished stones reflect light throughout a space. All you need are a few well-placed windows or lights and your polished stones will magnify it that glow. The area will feel bright, warm, and welcoming while also displaying a luxurious touch. This is one of the reasons why Adalia Cappuccino is such a popular choice for foyers and bathrooms. Adding light to the space takes away the dark and dreary atmosphere that may persist in areas with limited windows. Tiled backsplashes are growing in popularity because they require very little maintenance and look magnificent. Instead of paying a small fortune for your contractor to install a four-inch granite backsplash, cover the wall from counter to upper cabinet with marvelous Adalia Cappuccino. The brilliant polished finish will reflect light to help brighten this traditionally dark space and the colors will look amazing. The tones are consistent enough that it can blend with most other finishes, including exotic granites. While you may naturally be inclined to pair this stone with simple oak or maple cabinets, consider using it as a backsplash with white or ivory cabinets. If you choose painted cabinets with a stain overlay, then the soft coloring in this marble will help bring out the play of colors on your doors and drawers. This neutral stone looks incredible with white walls and creamy finishes, but it also works with darker shades. 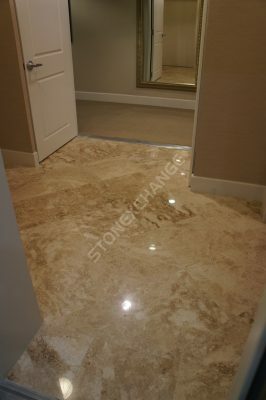 While the overall impression of this marble is shades of brown, it actually has a very soft feel to it and makes it the perfect neutral choice. It warms up areas that might feel cold and sterile otherwise. It adds depth and dimension to walls, countertops, and floors when you need some additional interest in a space. When you have dark tones in your cabinets, doors, or trim, the soft shades in the marble will help tie the space together and give it a sophisticated look. Some people work with designers to create specific looks for their homes, but others choose décor based simply on what they love and want to display. The problem with an eclectic style is that you can wind up with varying wood tones — leading to a space that feels jumbled. Adalia Cappuccino features many different shades of tan and brown, so it will help give your eclectic style a cohesive underpinning. With this simple addition, it’s possible to take a design plan from confusing to intentional. If you feel like your design themes are jumbled, then install this marble as a background to make everything a little more organized. Polished stones aren’t generally a good idea in exterior flooring because they tend to be slippery when wet. However, that doesn’t mean that you have to give up on this beautiful finish for your outdoor living space. Install the stones as a patio counter so that you’ll have a beautiful and functional workspace. Use them as the backsplash in your sharp new patio kitchen. The stone can also be used for pool coving. Bringing these impressive colors and textures to your outdoor spaces can make them more luxurious and enjoyable. When you’re ready to make this change in your home, work with the right supplier for your marble tiles. While you may need a local contractor for large slabs of marble, you can save a small fortune on your tiles by going through a wholesaler. We’re happy to work with the general public, and you’ll enjoy the same wholesale pricing that retailers normally receive. We have high-quality tiles for you to choose from, and we offer excellent customer service. We’ll help you place the order, and we’ll confirm everything to ensure that it’s properly filled. You can count on us for premium stones that are built to last, and we hope that you’ll be completely satisfied with our great service. Contact Nalboor today to learn more about our selection and excellent rates. You deserve to have a beautiful home, and we have the products you need to help bring that vision to life.